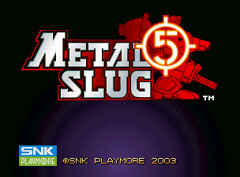 Latest opus in this famous plateforms/shooter games series initiated by Nazca and continued by SNK, then Mega and finally SNK Playmore. The principle is simple: go and shoot. This seems very limited but don't get it wrong, the game has much to offer! Graphics are incredibly detailed, ennemies mimics are hilarious and it blows and squirts everywhere. Add to this that the music is damn great. You begin your journey with a pistol, a knife and 10 grenades but you'll find numerous weapons (lazers, machineguns, shotguns, heading missiles, ...) and vehicles on your way. That's right, you can take control of planes, tanks, cars, robots and sub-marines. There're also ostages to rescue whom give you weapons for freedom. Levels are varied and you'll always want to insert another coin to see "what's next". 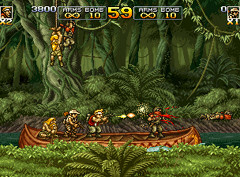 Metal Slug 5 is super fun, especially in 2 players where it's total mayhem! Nowadays, games of this kind are very scarces, we can even say this one is the only one!